Nicole is out before Lisa which is just making me more curious as to what's going on with that one. Location: Deep South, for the first time! Hammy wrote: Nicole is out before Lisa which is just making me more curious as to what's going on with that one. There is often one or two storms that come out strangely late. But usually late TCR's are either for the most notable storms (i.e. major landfalls) or those with disputed statuses or classifications. Nicole was NOT a landfall on Bermuda, which makes sense given the relatively modest winds recorded there compared to aircraft (I had previously suspected it had weakened well below the operationally assessed 105 kt at the time, despite the fact that aircraft supported such). Big thing to note with Nicole was after it passed Bermuda. It remained a tropical cyclone but according to the report, Nicole was transitioning to an extratropical cyclone before it regained tropical characteristics. May have been close to subtropical. I don't get hurricanes here but I do get their remnants. CrazyC83 wrote: Nicole was NOT a landfall on Bermuda, which makes sense given the relatively modest winds recorded there compared to aircraft (I had previously suspected it had weakened well below the operationally assessed 105 kt at the time, despite the fact that aircraft supported such). Being small as it is, wouldn't Bermuda have missed the strongest winds as the island is smaller than the eye and thus didn't receive any of the eastern half? Lisa and Seymour are out. After a lull, Ulika has been released. It seems the NHC is late publishing them, usually they are all out by now especially with the WMO meeting next week. I wonder why the delay? Only awaiting Matthew, Howard and Roslyn. In case anyone was curious in the average amount of time it takes for a TCR to be published... here's a chart. I wasn't able to get data on some storms because only the date of revision was listed and not the original publication date. Atlantic storms only for this data below, but I imagine EPAC figures would look similar. - Treat my opinions with a grain of salt. For official information see your local weather service/RSMC. 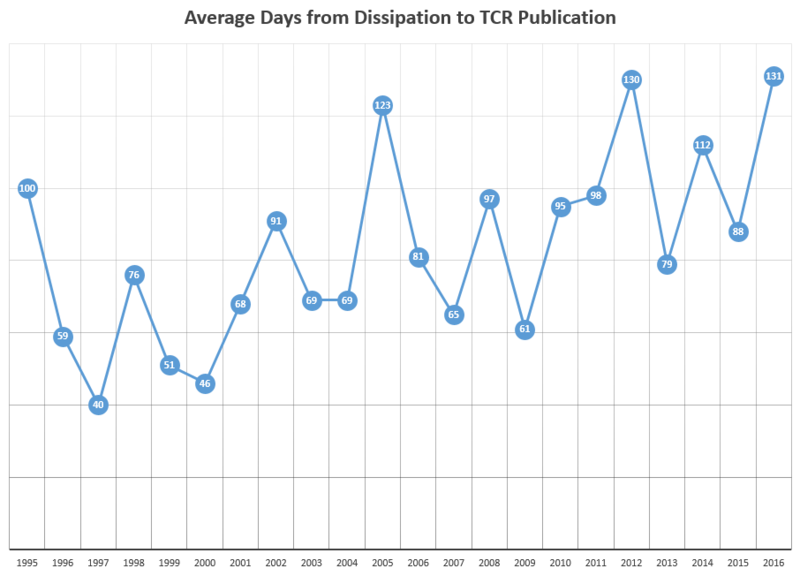 TheAustinMan wrote: In case anyone was curious in the average amount of time it takes for a TCR to be published... here's a chart. I wasn't able to get data on some storms because only the date of revision was listed and not the original publication date. Atlantic storms only for this data below, but I imagine EPAC figures would look similar. Slower seasons (especially when both the EPAC and Atlantic are near or below normal) are generally quicker, plus before about 2003 or so they were not as in depth. Nice to see a report again, been awhile since the last one. Blas formed over 9 months ago. Surprised Howard and Roslyn are taking awhile considering they were short lived storms. Matthew is understandable due to a lot of stuff to write and detail. Howard and Roslyn just released, finishing off the EPAC. Only Matthew is still outstanding, and that should be over 100 pages long. I hope the TCR is released soon for Matthew.... its been killing me to know what Matthew was really doing during its lifetime. Any predictions from you all about what the NHC may change intensity, track, damage estimates, etc? The following post is NOT an official forecast and should not be used as such. It is just the opinion of the poster and may or may not be backed by sound meteorological data. It is NOT endorsed by any professional institution including storm2k.org For Official Information please refer to the NHC and NWS products. Hurricane Matthew report is up. Matthew’s estimated peak intensity of 145 kt at 0000 UTC 1 October is based on SFMRmeasured surface winds of 143 kt at 0010 UTC. Post-storm quality control checks made by the NOAA Hurricane Research Division (HRD) suggest that was a reliable report. These peak wind speeds were observed at the end of the rapid intensification cycle, during which time Matthew’s radius of maximum winds had contracted down from 30 n mi to approximately 5 n mi. Quite a few interesting things I noted in the Matthew report. 1) If you look at the graph near the end, the KZC P-W for 145 kt at its wind peak was 916mb, while the actual pressure was 942mb. There was a significant difference in pressure there - so there may have been some other factors that allowed it to become a Cat 5 during that time. 2) They kept the intensity constant in the 11 hours before Haiti landfall. Yet it appears the satellite presentation improved in that time (with no Recon available). I would have at least gone 135 kt there and had a lower minimum pressure. 3) Some of the intensities near the coast were increased - the SC landfall upped from 65 to 75 kt. CrazyC83 wrote: Quite a few interesting things I noted in the Matthew report. The finalized data pushes Matthew's ACE above 50*10**4 kt**2 and put the year almost to 140*10**4 kt**2, the highest since 2010. Wayward meteorology student on a journey back to the promised land. It makes me wonder - should Felix in 2007 be revisited? At peak intensity, it had some similarities to Matthew - quite a high pressure, very deep convection and tons of lightning in the eyewall. It was analyzed at 150 kt based on a blend of data including an SFMR reading of 163 kt and flight-level winds of 161 kt, which supports about 145 kt (a data gap also existed as Recon was forced to leave due to graupel in the eyewall). Maybe the 163 kt SFMR is accurate and the peak intensity should be raised to 160 or 165 kt? In the case of Matthew, the flight-level winds never supported Cat 5 (highest were 143 kt at the time of lowest pressure, and they were around 140 kt at peak intensity, supporting an intensity of around 125 kt at that time), and in rapidly intensifying storms the 90% rule has been proven to often be inaccurate and an underestimate, particularly when convectively active. CrazyC83 wrote: It makes me wonder - should Felix in 2007 be revisited?